The football league have this morning announced the winners of their programme awards. There is a set of awards for each division. In deciding their winners they consider content, e.g. editorial over advertising, style, use of graphics and information. 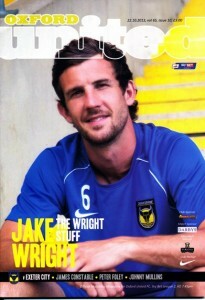 The winner was Oxford United. The 84 page programme is nicely bound, good amount of editorial and plenty of information, including a good write-up on the away team. 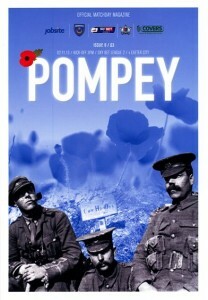 2nd place was taken by the Portsmouth programme. Similar in style and binding to the Oxford effort, the edition for the visit of the Grecians included a WWI commemorative poster. 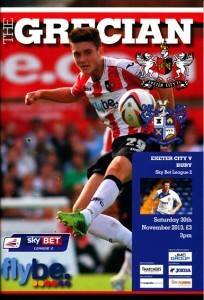 The programme also includes players cards that can be ripped out and collected. 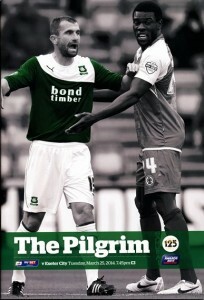 In 3rd place was the Plymouth Argyle programme. This 68 page effort is similar in style and binding to most other League efforts. Again a good balance of editorial over advertising and a good variety of items. Not too long! Over-use of photo-shopped photographs turned to black and white and a player coloured in. Newport County took 4th place. Similar to Argyle in style and binding. 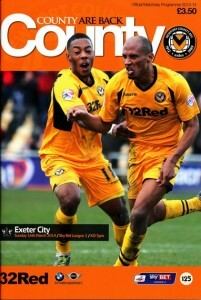 The 100 page programme has some good lengthy articles, both looking back and on current issues and players. Scunthorpe United were placed 5th. No placement for the Exeter City programme, possibly because of its 80 pages too much space is taken up by advertisements.